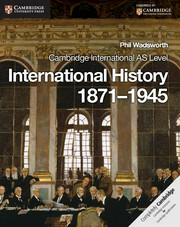 Cambridge International AS Level History is a suite of three books that offer complete coverage of the Cambridge International AS Level History syllabus (code 9389). 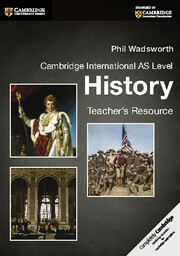 Written in clear and accessible language, this title enables students to achieve highly in their AS examinations. Features include key questions, timelines, definitions of key terms, profile of key figures, notes to highlight significant points and formative questions to consolidate learning. 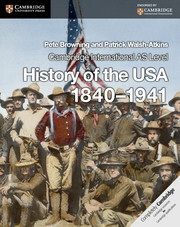 Each chapter reinforces knowledge and builds skills using detailed study of primary and secondary sources. Comprehensive exam support is offered with each chapter concluding in exam-style questions relating to Paper 1 (Source Investigation Questions) and Paper 2 (Structured Essay questions). 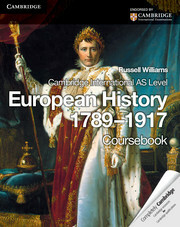 Further exam help is provided in the final Examination Skills chapter. Original source documents related to descriptive and contextual narrative. Clear, concise layout to guide students through content and methodology. What skills will examiners be testing and how?